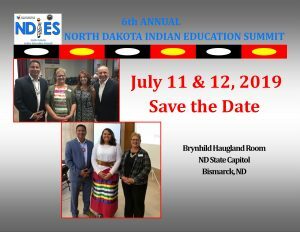 The North Dakota Department of Public Instruction (NDDPI),Office of Indian/Multicultural Education and the North Dakota Indian Affairs Commission announces the 6th Annual North Dakota Indian Education Summit (NDIES). This two-day summit will be held in Bismarck, ND on July 11-12, 2019 in the Brynhild Haugland Room at the North Dakota State Capitol. The NDIES is open to all educators and designed to provide professional development and best practices in Indian Education. Dynamic experts in special education law will present on such topics as parent rights/procedural safeguards, dispute resolution options, IEP procedures and OSEP guidance. The conference is designed for general and special education staff, administrators, state/school district attorneys, state education department staff, related services staff, parents and other stake holders. Pre-Summit to the ND Fall Educators Conference. The NDDPI Dropout Prevention & Re-engagement Summit is a professional learning summit featuring a keynote speaker and breakout sessions emphasizing a variety of strategies for students who are at risk of dropping out of school. You are able to use 5 contact hours at the Dropout Prevention & Re-engagement Summit towards the 15 credit hours needed at the ND Fall Educators Conference.